It’s not something you see everyday, or even every year, but on June 17, 52 tall ships will sail past Castle Island, continue up to Charlestown, and then turn around to sail into Boston’s seaport. In formations of five or seven ships, these magnificent flotillas will make up Sail Boston’s first Grand Parade of Sail since 2000, and include tall ships from all over the world. Not surprisingly, getting 52 massive ships in one place takes immense preparation — and even a little pleading. Sail Boston’s last event in 2009 brought 38 tall ships into the harbor, but because of a lack of public financing, there was no parade. “The city has to be behind an event like this,” says Rhodes. Clearly, this year, it is. Visitor spending for hotels, restaurants, etc., according to event organizers, is expected to bring $120 million into the city. While not all of the ships in the parade are competing in the whole of the regatta, all the ships on the Bermuda-to-Boston leg are in the parade. The oldest ship in the parade, the Europa from the Netherlands, was built in 1911; the youngest, Union from Peru, was built in 2014. The crews range from 16-year-olds to “old salts of 65 years,” says Rhodes. In April, the oldest full-rigged ship in operation in the world, Norway’s Sorlandet, sailed into Boston Harbor. In mid-March, the Mexican tall ship Cuauhtémoc paid a five-day port of call. 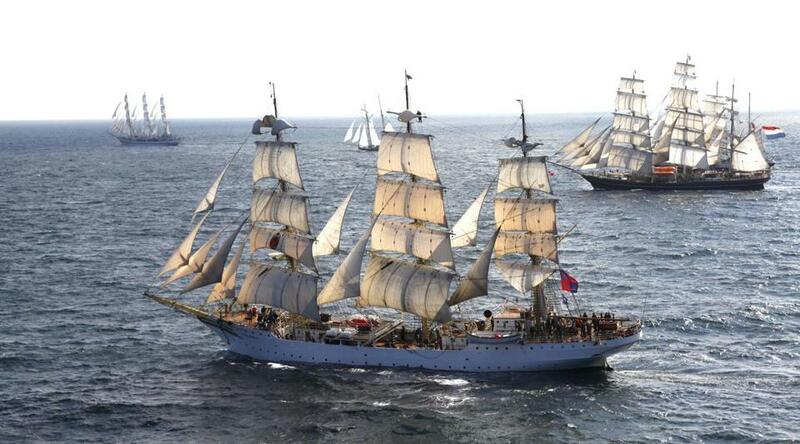 But a single ship can’t compare to the Grand Parade of Sail’s spectacular array from 9 a.m. to 3 p.m. on June 17. The parade is free to view from public locations, but tickets are available to watch from a grandstand on the Seaport’s Fish Pier ($125), including entertainment. To see the flotillas pass by Castle Island, Rhodes suggests being there by 10 a.m., after which they wind their way up to Charlestown and then into the harbor, where the docked ships have free open houses. The parade will take more than two hours to complete. This year, Boston is the only US port on the race route, chosen because of the seaport’s geography.